Something that can take your blog to a whole new level. Resulting more visitors, more conversions and also more credibility (which is pretty important). To succeed online you need to look professional so that people know you are dedicated to what you do. If you don’t people might bounce off your blog, may not buy what you sell/recommend, many would not trust you and your fellow well-heeled peers might not look at you as an expert. 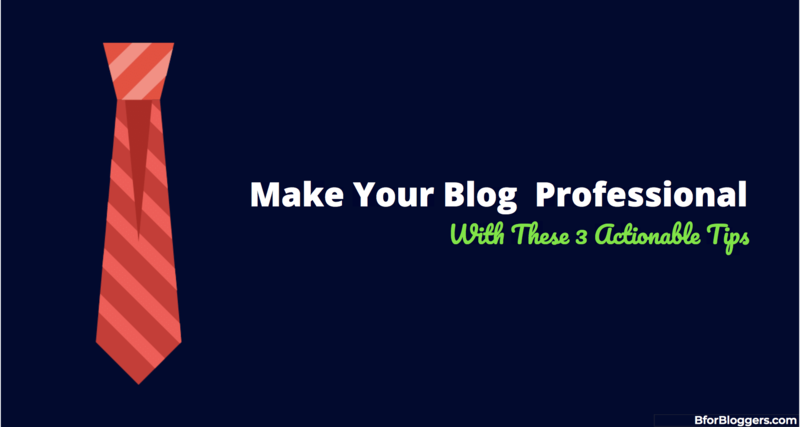 In this article, I’ll show you how you can make your blog professional in 3 simple ways. If you’ve read atomic habits, you might know small changes result in big success. Small changes in your blog can help you look more serious and build trustworthiness among your readers. Do you edit your content before publishing? I don’t need to tell you how important good grammar and spelling is. You must edit each and every piece of content before publishing it. Not everyone possesses a broad vocabulary, grammar knowledge and copywriting skill. Here comes in writing assistants. Tools that help you write better blog posts and any kind of copy you may want. It is a tool which helps you proofread your content so that you avoid grammar mistakes. Along with that it also helps you find better synonyms for commonly used words to improve your vocabulary and reduce the number of times I mention a similar word. Grammarly has a browser extension for chrome, safari and a desktop app. You can use it for free as the free plan checks for grammar errors and allows you to correct them in one click. It also has a premium plan which refines advanced mistakes, plagiarism and helps you improve your copy. You can download Grammarly from here. If you do a lot of writing not only for your blog but for your clients, ProWritingAid is a great proofreading assistant and should be in your tool’s arsenal. You can try ProWritingAid from here. 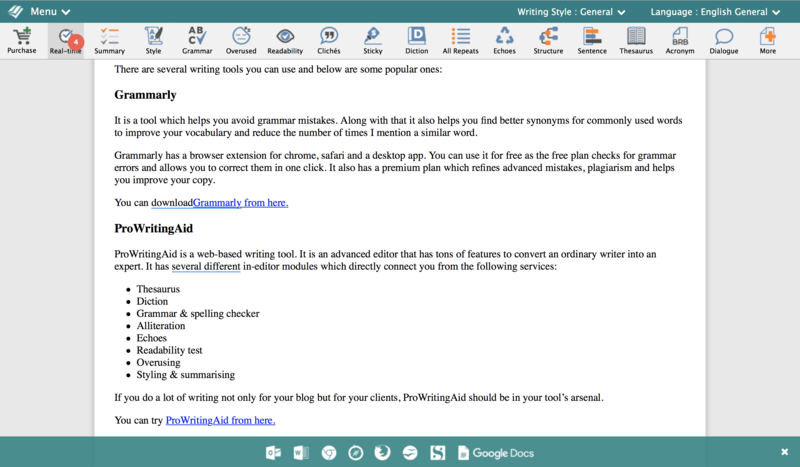 Hemingway editor is one tool copywriters use on a regular basis. Yellow indicates moderate while red indicates very hard to read sentences that you need to re-write. WordPress has thousands of free themes. But not all of them are up to mark. Most of the free themes have comparably similar looks and very low customization options which make it hard to create a branded look for your blog. When you want to create a professional brand, you need a design that’s distinctive and particular to your blog. The above two themes come with a premium add-on which will help you completely change their look to create a new theme. Doing so, you’re blog will have a distinctive look and won’t look just another blog on web. A good theme should be mobile responsive and SEO friendly. 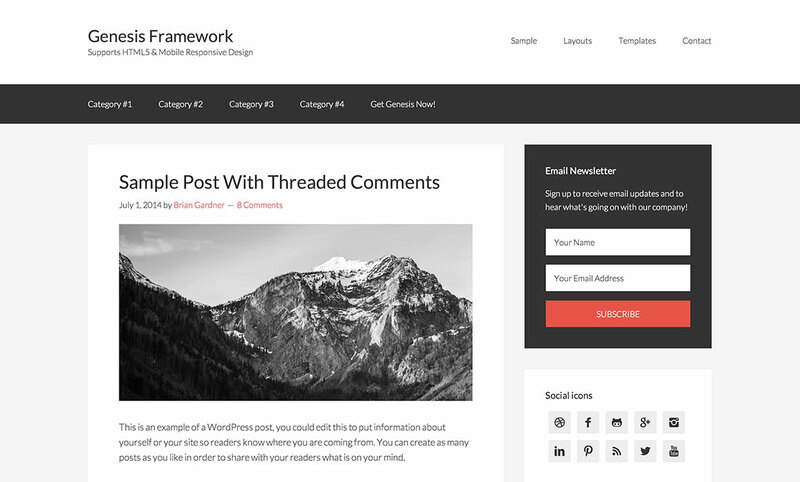 If you have been blogging for a while, you might want to upgrade to a premium theme such as Genesis framework. It has been one of the most popular premium WordPress themes of all time. People like to skim through content. Blog posts are no different. Most of the people who click through your post won’t read it top to bottom. And if they feel you’re not proficient enough to write about the topic, they’ll leave as fast as they come. More than 55% of average web users spent only 15 seconds on a web page so it’s critical that you optimize and format your blog posts to engage your visitors. You want people to stick to your content for long and possibly convert those people into your subscribers. How do you format a blog post? Below are a few ways you can format blog posts so that people stick to your content and hopefully convert. Subheadings make it easy for a reader to navigate through all of your content. Subheadings will help your readers find what they in your content, fast. 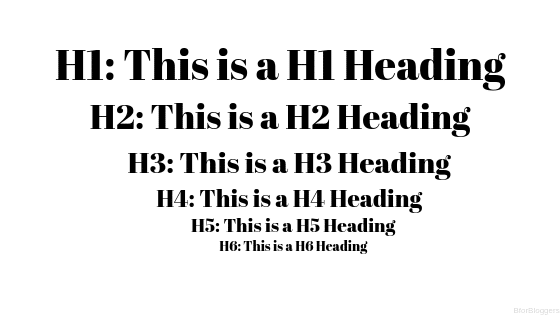 When you add enough headings, it makes your content highly readable. It breaks your content in parts which makes it easy to consume. Not only it makes readers happy, but it also helps search engines to understand your content. So, next time you write content, be sure of breaking it down with some headings in between. The image above shows you why you should not write lengthy paragraphs. It makes the complete article difficult to read. When most people skim, they skim the parts that are overcrowded such as long essay-like paragraphs. Shorter paragraphs help to avoid this. 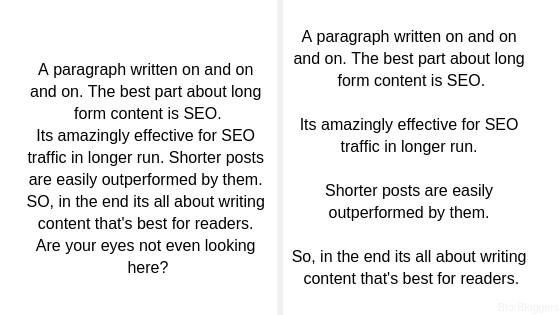 When you write paragraphs that are 1-3 sentences short it makes each sentence more readable. It also helps to increase whitespace on your blog which keeps a reader focused on your content. Bucket brigade is a copywriting element that was primarily used for sales copy. And it worked great. Bucket brigades create a hook in monotonous content, a hook that forces readers to read the next sentence to discover what’s next. You create a bucket brigade by writing a very very short sentence ending with a colon. You should use Bullet points to highlight and keep specific information in contrast. The piece of information readers must pay attention should go inside bullet points. This helps readers to digest content in parts rather than reading unwanted fluff. The more professional and readable your content is, the more your readers will like it (and share it). You can’t afford to be taken as an amateur who doesn’t know what he/she is talking about. Implement these strategies in your blog now to achieve great results. Let me know in the comments your favourite techniques from this post ( and your own too ).